The solar panel systems and installation market in California has exploded since 2013. Chart via the Solar Energy Industries Association. Indeed, increased competition in the state since 2013—and the nature of the market on a national scale—means residents are primed for home value increases if they install solar panels in California. More specifically, researchers project the value of a home powered by solar paneling increases up to $15,000 on average, according to the Berkley Lab, one of the federal government’s national renewable energy laboratories. On top of that, seasonal price fluctuations mean winter could be perfect for a solar home improvement project. Like every other state, California has a unique set of incentives, benefits, and challenges when it comes to investing in solar panels for houses. Read our residential guide to understand what you should know as a homeowner as you look for the best contractor to install solar roof panels under the shining, Hollywood-inspiring California sun. A well-informed and reliable contractor will go over each detail of your installation with you, from expected savings to increases in home value. At Modernize, we frequently speak to homeowners about their home improvement projects. In our recent interviews, 90 percent of homeowners requested a checklist to help them find and vet contractors. Modernize now offers homeowners a free, digital Contractor Checklist as a simple, step-by-step guide to assist with your solar panel project. Will Clever, a retired 67-year-old who recently relocated to Roseville, Calif., considers his investment in solar paneling system “money in the bank,” he told the New York Times. Clever’s reasoning is actually one of the reasons Modernize recommends the best time to install solar paneling is now—waiting for the warmer months to undertake a home improvement project that could take months to complete could end up delaying your potential increase in home value, not to mention savings. A local and experienced contractor will be fluent in solar energy’s California nuances, qualified to advise you on the best path you should take in your journey to increase the value of your home. Ensure you ask your contractor about your financing options, whether you buy or lease, and which system makes the most sense for your home and needs. Solar panels in California are responsible for providing nearly a fifth of the state’s electricity, and the industry employs more than 86,000 workers. Therefore, solar panels have a sizeable effect on utility bills. Accounting for costs and related expenses, solar panels in California will save homeowners approximately $16,251, according to the energy commission’s official findings. Overall, the commission predicts residents will collectively save $3 billion across the state. All of this data serves as guidance for your journey to home improvement. Use it during your conversation with contractors in your area. Ask for this level of detail in your estimates and if jargon or complex wording seems confusing, ask for clarification. A trusted contractor will be glad for the opportunity to explain what everything means and, more importantly, what it specifically means to you. When it comes to California’s solar energy, for example, existing financial incentives only make it more lucrative for you to sustainably increase your property value. There are currently 188 incentives for homeowners to increase the value of their property by installing solar panels for houses in California. Find details about each program at the state’s Database of State Incentives for Renewables & Efficiency (DSIRE). 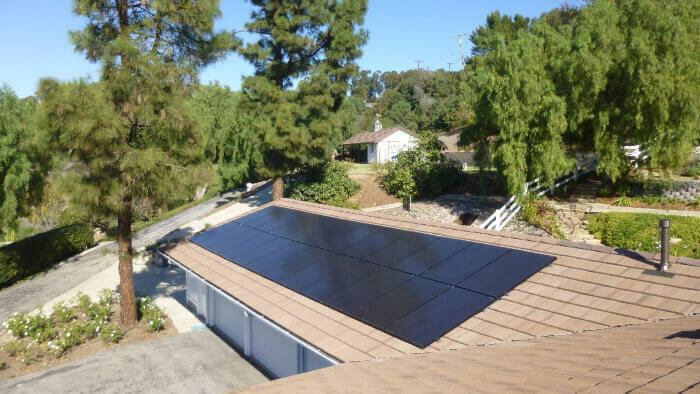 Solid contractors installing solar panels in California will be able to provide a list of applicable costs savings measures and help you navigate applying for and getting the most out of them. Learn enough to have a foundational understanding of these programs to best talk to your contractor about them once you’ve vetted and chosen one. Installing solar paneling for homes will increase property value for homeowners who have invested in their houses, and California is investing right back in them. The state provides a “100 percent” tax exclusion for certain solar energy system. In other words, you’re not paying taxes on any of the added value of your property. While the exclusion applies to most systems, from solar heating systems to solar roof panels, there are exceptions: “Solar pool heating systems and solar hot-tub-heating systems are not eligible,” according to DSIRE. Find all the details at DSIRE’s profile for the program. Since 1996, if your California solar panels collect more energy than you use, you can sell your excess energy back to your energy provider. They have to credit you for it—in other words, you are selling them the energy collected by the solar panels powering your home. And the credit has to be “carried forward to a customer’s next bill at retail rate.” Additionally, you can stock up on excess energy and, at the end of a 12-month period, choose between carrying it forward again or selling it back for payment. In other words, California allows residents to make cash money off of their solar investment, untied to credit with a utility provider. Of course, you want to get the most out of local programs as well as federal ones, like the temporary Residential Renewable Energy Tax Credit, which applies to up to 30 percent of your installation. It is important to note that this federal credit is for systems placed in service by 12/31/2019. Solar Energy International reports that a typical five-kilowatt solar system installation in September 2018 would’ve dropped from $15,428 to $10,800 after the rebate is applied—but keep in mind its value is dropping and the credit could be completely gone by the early 2020s. Consult your contractor about this and other available credits and incentives to ensure your investment in the long-term value of your property is as easy on your current assets as possible. That’s why you’ll want to find a contractor you can trust—a local professional who can get the job done and assist you with navigating local policy and regulation. The Modernize Contractor Checklist will help you vet a trusted contractor, so you can relax knowing your solar panel project is in good hands. Arizona: A Guide to Residential Solar Energy	New Jersey: A Guide to Residential Solar Energy	How Solar Panels Improve Your Home’s Value	Are Solar Energy Savings Affected by the Changing Seasons?